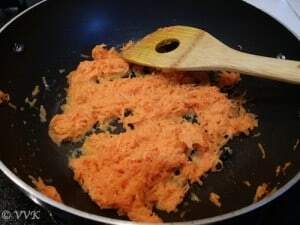 Gajar ka halwa or Carrot halwas is also known as gajrela and it is a sweet prepared with carrots, milk and sugar and garnished with nuts which are sautéed in ghee. 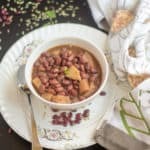 This is a popular North Indian dessert and it was introduced by the Mughals. 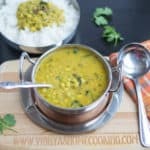 This is one of the main recipes and it is prepared for Diwali, Holi, and Ed. 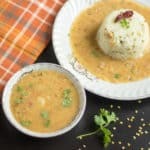 Because of its ease of making, it is very popular worldwide and there is lot of variations to this recipe and here is mine with sweet condensed milk. 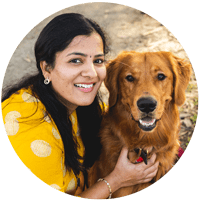 I started to celebrate Holi only after coming to US. Never been to a big mela for playing but we celebrated couple of times at friends place and it’s always fun. Last year with house move and stuff we couldn’t celebrate both Ugadi and Holi. Let’s see how this year goes. Between got a chance to review ‘Dev-Olli, Color Carnival’, an amazing book to teach and explain Holi for kids. There are giveaways too. So don’t miss it. Few saffron strings for garnish. 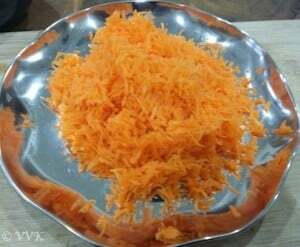 Wash and peel the skin of the carrots and grated them. Crush the elaichi and set aside. 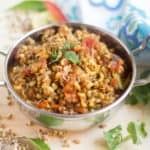 Heat the kadai or pan and add ghee. 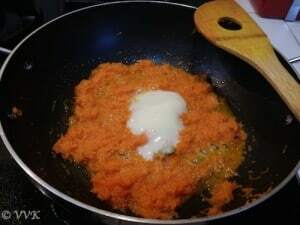 Once the ghee is hot add the grated carrot and 3 tbsps of milk. Let it cook for about 5 minutes. Make sure you keep stirring for every one half minute or so. Now add the sugar and mix well. Let the sugar melt and blend along. Now add the condensed milk and the crush elaichi. 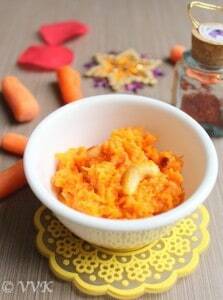 Let it cook till the ghee separates and the carrots comes together as a ball. Now in a separate tadka pan, heat the 1 tsp of ghee and fry the cashews. 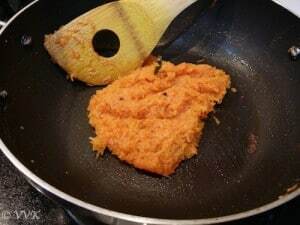 Once the cashews are golden brown, add it to the halwa. That’s it. Quick and yummy halwa is ready. Garnish with saffron and serve hot. Elaichi can be replaced with elaichi powder. Instead of sugar, you can add more condensed milk and skip the sugar also. 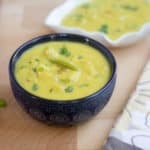 Saffron soaked milk can be added instead of plain milk. 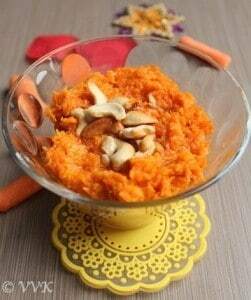 Gajar ka halwa or Carrot halwas is also known as gajrela and it is a sweet prepared with carrots, milk and sugar and garnished with nuts which are sautéed in ghee. 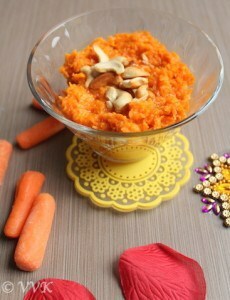 Love the simple version of carrot halwa, good one Vidhya! Love your version. Looks so perfect and delicious! Oh yum… totally want to eat this halwa right now! :-) :-) Thanks a lot. Wish could send you some. 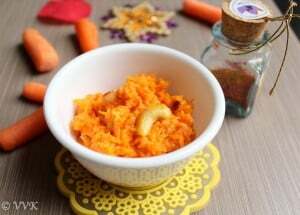 What a nice step by step recipe for yummy gajar halwa, Vidya! Love it!